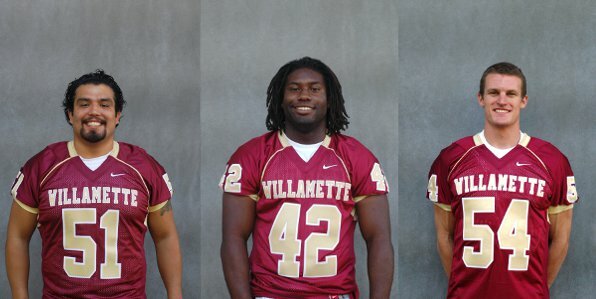 (SALEM, Oregon) - Three Willamette University football players have been selected to play for the NCAA Division III All-Star team that will take on the CONADEIP All-Stars from Mexico in the 2010 Tazon de Estrellas (Bowl of the Stars) on Saturday, Dec. 18 in Toluca, Mexico. The Willamette players are senior inside linebacker Ralph Pineda (Los Angeles, CA/Cathedral HS/San Jose State Univ. ), senior defensive end Walter Robinson II (Altadena, CA/Cathedral HS) and senior wide receiver Scott Schoettgen (Columbia, CA/Sonora HS). The U.S. players will compete for Team Stars and Stripes. The game will be played at the Tec de Monterrey Stadium, with kickoff set for 1 p.m. (EST)/10 a.m. (PST). A live webcast will be available through the Universidad de las Americas Puebla (UDLAP) at "http://www.udlap.mx/tvudlap/deportivos.aspx". "This game is sponsored in part by the American Football Coaches Association (AFCA)," said Willamette Head Coach Mark Speckman. "It is a real honor to be selected to play. Many players were nominated and we were fortunate to have three players picked by the selection committee. They will have a chance to play with some of the best players in Division III from around the country." Pineda topped the Bearcats with 84 total tackles in 2010. He earned 34 unassisted tackles and contributed 50 assists. He tied for second on the team with three interceptions. He also forced a fumble and recovered a fumble, while making 7.0 tackles for losses and 2.0 sacks. In two seasons after transferring from San Jose State University, Pineda registered 165 tackles for the Bearcats. He repeated as a First Team All-NWC selection after being chosen NWC Defensive Player of the Year as a junior. In addition, he was named First Team All-West Region and Third Team All-America by D3football.com in 2009, and was named Second Team All-West Region by D3football.com in 2010. Robinson ranked second on the team with 59 total tackles. He recorded 23 solo tackles and achieved 36 assists. He led WU with 13.0 tackles for losses (74 yards), including a team-high 5.0 quarterback sacks for 34 yards lost. He registered six quarterback hurries. Robinson was named First Team All-NWC in 2010 and was chosen Second Team All-NWC in 2009. During his career, Robinson achieved 152 total tackles, as he earned 77 unassisted tackles and 75 assists. He made 26.5 tackles behind the line of scrimmage for 119 yards in losses and recorded 11.0 quarterback sacks. He started all 20 games during his junior and senior seasons. Scott Schoettgen was selected First Team All-NWC in 2009 and 2010, and was chosen Second Team All-NWC in 2008. This year, he led the Willamette receivers with 49 catches for 960 yards and 13 touchdowns. He averaged 19.6 yards per catch and 4.9 receptions per game. He also caught 49 passes as a junior in 2009, when he gained 840 yards and reached the end zone 14 times. Schoettgen holds a Bearcat record with 36 career touchdown catches. He earned 129 career receptions for 2,445 yards. He averaged 19.0 yards per reception during his career. A live webcast of the Tazon de Estrellas (Bowl of the Stars) will be available at www.udlap.mx/tvudlap/deportivos.aspx on Saturday (game time is 10 a.m. PST).